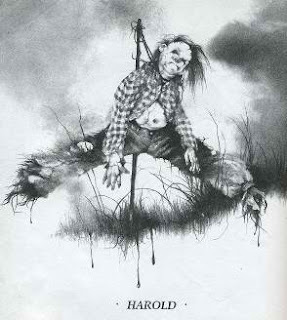 If you are looking for the perfect, scariest, creepiest Halloween read, no horror novel will ever top the creepiness factor of the Scary Stories to Tell in the Dark series written by Alvin Schwartz. Alvin Schwartz's collections of short stories have been banned in the United States because they have been deemed satanic, horrific, and entirely too disturbing for children. If you've ever picked up one of Schwartz's books, you may understand why uptight, anti-fun-police citizens have wanted the books banished. After all, the book's illustrations are downright bone-chilling and just might give you nightmares, but only if you've never been exposed to any of the crime shows aired on basic network television, have never visited a circus, or have never experienced a busy shopping day at Walmart alongside the most scariest, trashiest people of the world. Alvin Schwartz's short stories collections are the epitome of everything Halloween for both adults and children; encompassing the memory of every childhood campfire, every slumber party in which you've read aloud from the books while illuminating your face with a flashlight held below your chin, and every other nostalgic event that reminds you of your favorite Halloween memories. In 1981, Alvin Schwartz released Scary Stories To Tell in the Dark, followed by More Scary Stories To Tell in the Dark in 1984, and finally, his much awaited release in 1991 entitled Scary Stories: More Tales to Chill Your Bones. Unfortunately, the illustrations in Schwartz's books have been replaced by more innocent, less nightmare-inducing illustrations in the newly packaged editions of the books; however, if you can get your hands on original copies, you will definitely appreciate the stories more. Do I recommend Alvin Schwartz's Scary Stories books for young children? YES! I certainly do! After all, it's up to us as parents to explain and educate our children on the various forms of entertainment, which is exactly what these books are. My brother and I began reading these books when we were 6 years old, and reading them at Halloween under a camping tent together was a tradition we upheld for years until both of us moved out. In fact, Alvin Schwartz set the bar for horror novels so high, that I was never once scared out of my wits again until I discovered the wonderful world of Graham Masterton. Type "Graham Masterton" into the Google Search bar located in the upper-right corner of this website and read the many reviews that have been written on novels by this amazing horror novelist. 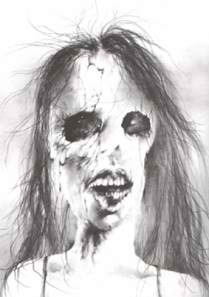 Do yourself or your children a favor this Halloween and purchase any copy of Alvin Schwartz's Scary Stories books, but ONLY given they are illustrated by Stephen Gammell. If you don't like them, consider yourself part of the cult classic horror novel club for purchasing them in the first place and share them with somebody who will appreciate them. Have you read Alvin Schwartz's "Scary Stories" collections? If so, what did you think? Are they as nostalgic for you as they are for me? If not, what are your favorite Halloween novels? Thank you, Alexander! Thanks for stopping by - glad you enjoyed the post. I remember these books growing up! My older sister used to read them to me and the scariest story was the urban legend classic about the man with the hook. The pictures were also very creepy, but I doubt lots of parents would let their children read these books nowadays. I remember these books, actually from my first grade teacher! I find it amazing reading about how much they were banned in elementary schools, when my very own first grade teacher used to read them to the whole class with the lights off!